The voluntary carbon market shrugged off policy failures and the closure of the Chicago Climate Exchange in 2010 to post a 34% surge in volume to a record 131 million tons of carbon dioxide equivalent (MtCO2e) worth at least $424 million, according to “Back to the Future: State and Trends of the Voluntary Carbon Markets 2010,” published today by Ecosystem Marketplace and Bloomberg New Energy Finance. The OTC market last year transacted 127.9 MtCO2e, or 97% of global market share. A single bilateral OTC transaction of CCX Carbon Finance Units (CFIs) totaling 59 MtCO2e substituted for collapsed exchange activity but will not likely be repeated, according to the report. Even excluding this statistical outlier, OTC volumes were higher than in any previous year (68.7 MtCO2e). In 2010, land-based projects supplied the largest volume (28 MtCO2e) of credits transacted in the OTC market. Latin America especially benefited from the development of new methodologies for projects aimed at saving endangered rainforest and capturing carbon in trees – a mechanism known as “Reduced Emissions from Deforestation and Degradation (REDD)”. REDD projects alone generated 29% of credits transacted in the voluntary market. The surge of REDD activity led to market activity in the developing world. This included a doubling of credits from Latin America, as well as more than doubling of the number of project developers and buyers headquartered in Asia, Latin America and Africa – thus laying the foundation for long-term growth in the Global South. Renewable energy projects tied with methane activities in overall market share (20%). Wind projects were responsible for over half (53% or 6.7 MtCO2e) of last year’s renewable volumes, while others looked to hydropower and biomass projects for their CSR investments. The Verified Carbon Standard (VCS) retained its top billing among third-party standards in 2010 with 34% of transaction volumes. 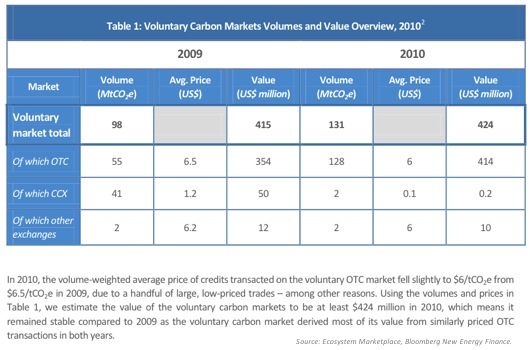 VCS forestry credits alone (14.1 MtCO2e) transacted almost enough volume to top the charts. The second-largest volume of credits transacted in 2010 (15.5 MtCO2e) came from projects validated by Climate, Community and Biodiversity (CCB) Standards. Projects using the Climate Action Reserve protocols transacted the third-largest volumes (13.4 MtCO2e) in the voluntary market. But in a report published yesterday, The World Bank has found that the 2010 global carbon market ended five years of growth with a decline compared to 2009. The State and Trends of the Carbon Market 2011, released at Carbon Expo in Barcelona, shows that the total value of the global carbon market was estimated to be US$142 billion last year. The report’s authors noted that several reasons help to explain the decline, including a lack of clarity about the market after 2012 and the loss of political momentum on setting up new cap-and-trade schemes in several developed economies. Some buyers from industrialized countries, which in previous years had reached or surpassed targets, consequently made fewer purchases in 2010. As well, lingering effects of the recession in several industrialized countries led to lower greenhouse gas emissions, easing emissions reduction compliance obligations. Furthermore, the primary Certified Emission Reductions (CERs) market, which accounts for the bulk of project-based transactions, fell by double digits for a variety of reasons, including lower demand for credits and competition from more predictable assets (Assigned Amount Units and secondary CERs). The CDM market is now at its lowest level since the Kyoto Protocol entered into force in 2005, having dropped by 46% to an estimated US$1.5 billion in new project-based transactions. Similarly, other carbon markets also declined or stayed at their plateau. EU Allowances (traded under the EU Emissions Trading Scheme, ETS) remain the largest segment by far, with 84% of the total value of the carbon market. Taking secondary CDM transactions into account, the value of the market driven by the ETS reached 97% of the global market value. The authors of the report predict that, in the next two years, the difference between gross demand for and the cumulative supply of carbon credits generated under the Kyoto flexibility mechanisms will be slightly less than $140 million. Virtually all demand will be from European governments.